Such opinion that Trump might order a pre-emptive attack on the DPRK is widely spreading among former and incumbent officials of the US administration, media and experts recently. Those concerned of the US Department of Defense think that the possibility of an armed clash on the Korean peninsula with a US pre-emptive attack next year is 40 to 50 percent, and some former officials of the Department of State comment that the possibility of a war between the DPRK and the US is more than it. Recalling Trump's recent special meeting with some hard-liners insisting on a pre-emptive attack on the DPRK, US media are claiming "the war chariot of the Trump administration began to move" and "it is reminiscent of the Bush administration preparing for a war against Iraq." In view of the present situation, there is widespread concern and criticism among Americans that "if a war with north Korea breaks out, a disaster more terrible than the one during the Second World War might be brought to the US mainland" and "it will cause such a disastrous result as killing of up to two million in the US, south Korea and Japan”. Former Rear Admiral Michael Smith and 57 other ex-generals of the US army sent an official letter to Trump on December 13 in opposition to his war scenario, claiming military action of the US and its allies might invite immediate retaliatory shelling by north Korea which would cause hundreds of thousands of casualties. Military action will only put in peril the lives of 150 000 Americans living in south Korea and the US is bound to be involved in the war which might be prevented, they added. Charles V. Pena, former director of the Defense Policy Institute of the Cato Institute in a commentary he contributed to the international relations magazine National Interest asserted a total war with the DPRK would bring very critical consequences. The commander claimed that if a war with the DPRK breaks out, it would cause at least one million casualties and economic loss of one trillion US dollars. 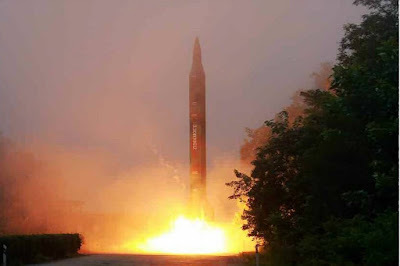 Even a limited attack on the DPRK's nuclear missile bases will not be accepted by it as a limited one. To think the DPRK would remain passive toward the attack is a pipedream. Such attack will only entail strong retaliation by it. A professor of the US asked Trump as to whether he, as a reasonable president, can unleash a war against Pyongyang although he knows that it can launch a missile tipped with nuclear warhead before the US forces' air strike reaches it. The results of the opinion poll conducted by The Washington Post and ABC found that at least 70 percent of the respondents said no to the pre-emptive strike and 82 percent of them expressed serious concern that military attack would spill over into a large-scale war. The US magazine News Week reported the opinion poll results that two third of Americans remain averse to the war with the DPRK. The public opinion opposed to the pre-emptive attack is getting stronger in the US. It can be viewed as a sort of advice that the US administration should drop the adventurous and risky way of thinking and boldly make a U-turn in its policy toward the DPRK. The right to a pre-emptive attack is not exclusive to the US. The US should cool-headedly face up to the reality that the iron-willed DPRK's pre-emptive nuclear attack against provocateurs is not hot air.